Concussions. Think they’re the type of injuries that only happen to pro athletes? Maybe it’s time to give it more thought. That’s what Preventable is hoping British Columbians will do because the idea that concussions only happen to elite-level players couldn’t be further from the truth. The fact is, no one is immune to concussions. Not a single person. Between 2001/02-2013/14, there were 8186 hospitalizations in BC due to concussions – that’s an average of 630 cases per year.1 In 2014, BC Children’s Hospital emergency department saw 410 children and youth with a concussion.2 A staggering number, to say the least. A concussion is defined as a brain injury resulting from a direct or indirect blow to the head or body that causes movement of the brain within the skull.3 We still have a lot to learn about concussions but what we do know is that a change in brain function occurs – resulting in a variety of non-favourable symptoms, such as headaches, memory loss, blurred vision, sensitivity to light, confusion, irritability, and difficulty in concentrating, to name just a few. 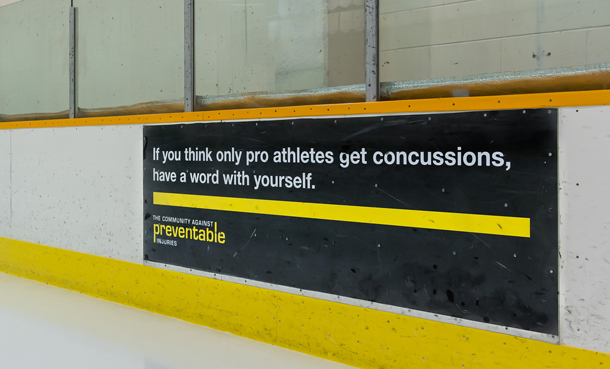 At Preventable, we realize that concussions happen, and that recognizing and reporting a suspected concussion is a key first step to minimizing the risk of long-term health consequences.3 But we also believe that in many cases – during a public skate or hockey game, for instance – concussions can also be prevented. If we all start thinking about our actions, we can avoid a serious head injury and stay in the game. Data Source: Discharge Abstract Database (DAD), Ministry of Health, BCIRPU Injury Data Online Tool, 2016. Data Source: BC Children’s Hospital, Canadian Hospitals Injury Reporting and Prevention Program (CHIRPP), BCIRPU Injury Data Online Tool.